One of the most evocative destinations of Sicily is Syracuse indeed: a city where legends, mythology and ancient traditions meet, expressing the whole delicate cultural mixture of Sicily – from prehistory to the present. One of the most famous cradles of Sicilian culture. The charm coming from its ancient streets and buildings that you’ll feel just walking through its old fascinating city centre is simply breathtaking. Its magnificent historical centre is in fact “UNESCO World Heritage Site” – see UNESCO web site – the little island of Ortigia, the evidence of the former importance of the city, that was a dominant, strategic location of ancient Greece, as well as one of its most beautiful and densely populated metropolis. Its archaeological site, with breathtaking monuments such as the Greek theatre and the Roman amphitheatre, cut directly into the rock and modified several times over the centuries is today the most visited destination in Sicily, so it’s very easy to understand why we love this city and why our Syracuse villas are so famous and requested. 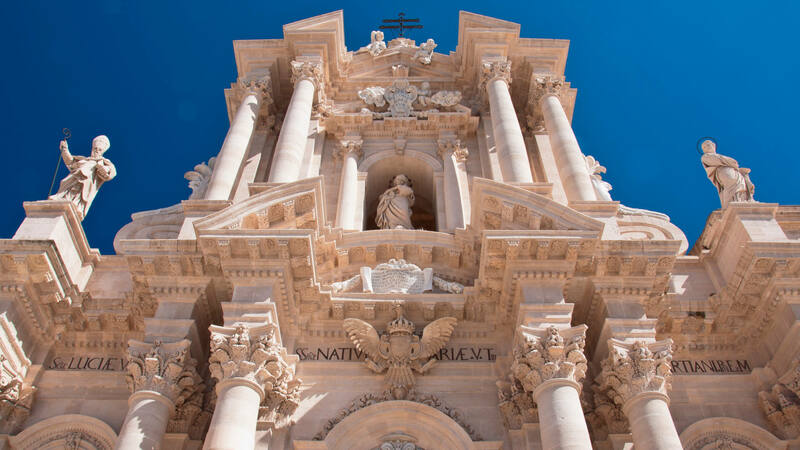 Syracuse has also been a Byzantine, Arabic, Norman, Svevian and Spanish city: its multi-cultural soul can be experienced through a visit to the little pearl of Ortigia. Walking among Greek monuments and Norman buildings, Baroque churches and Arabic courtyards, along narrow little streets ending up in little balconies giving you delightful glimpses of the blue sea surrounding the island, is one of those activities you really can’t miss during your stay in our villas in Syracuse. The surroundings must not be missed as well! The South-eastern side of Sicily is full of uncomparable natural sites, such as the Pantalica necropolis and the Baroque city of Noto (both UNESCO World Heritage Sites), as well as the Vendicari Nature Reserve with wonderful white sandy beaches. Scuba diving lovers will find the perfect place to practice in the Plemmirio sea park, on the Maddalena peninsula, a few kilometers South from Syracuse. Click for the full catalogue of our Villas in Sicily!